Two soups in one bowl makes a most festive first course for a holiday or special occasion meal. I’ve served this pureed vegetable soup duo on many occasions and these two soups in one bowl always elicits surprise both for color and the combination of flavors. 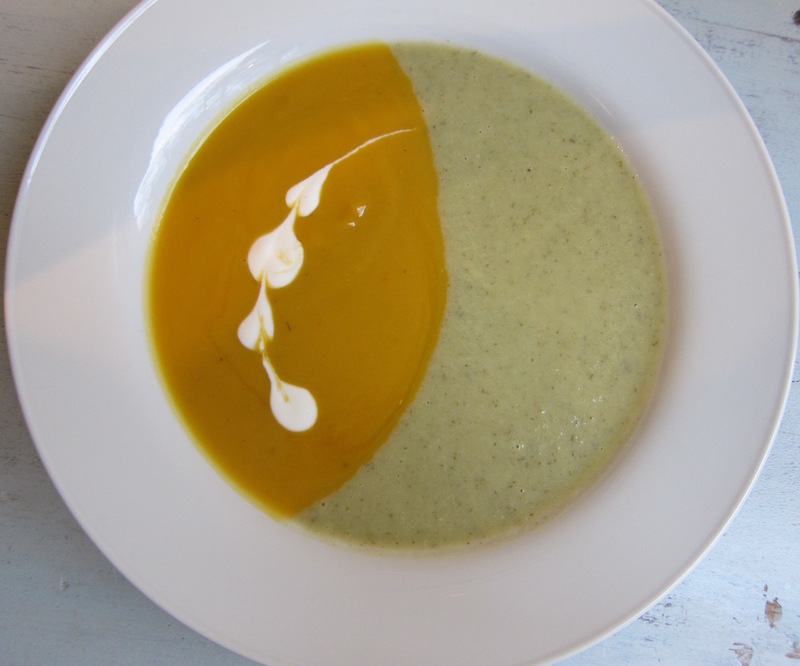 Both soups are straightforward vegetable purees, brightened with acid and extended and lightened in color with a small amount of half&half. The pale green and orange colors also a natural couple that fall opposite each other on the color wheel. Fennel isn’t the best known vegetable. It’s appears on many Mediterranean tables, most notably Italian, where it is served in many ways from raw and shaved to braised. With a flavor like mild licorice-celery, it pairs nicely with the sweetness of the butternut squash. 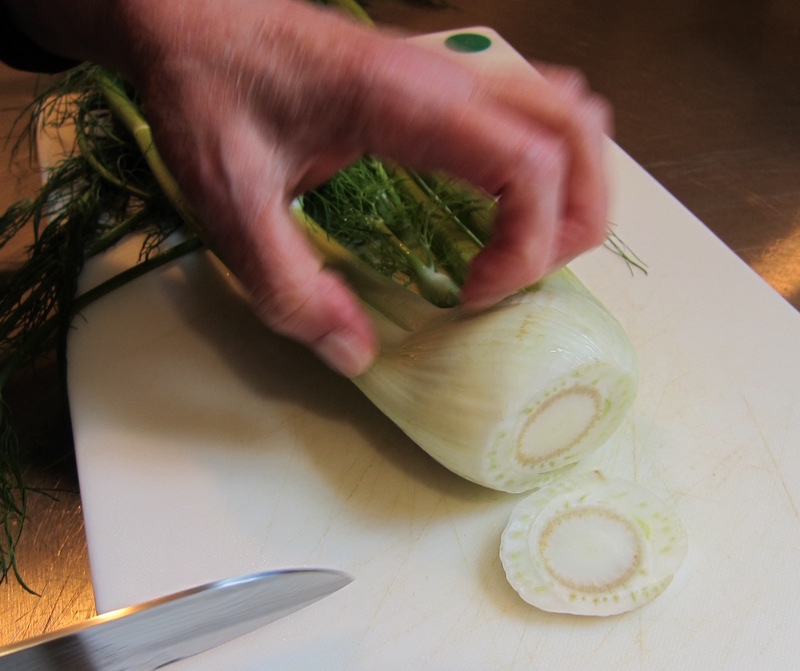 Preparing fennel is easy. 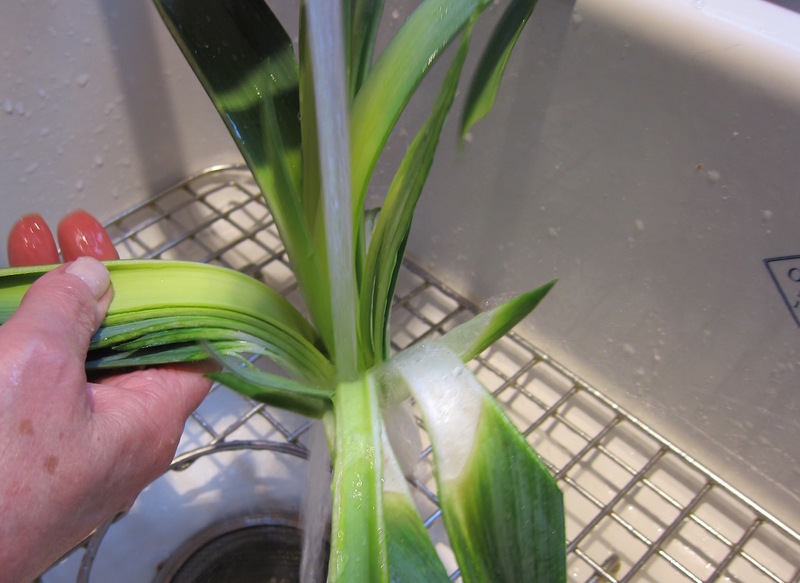 First, cut the bottom off the bulb and trim back the stems. Quarter the bulb lengthwise. 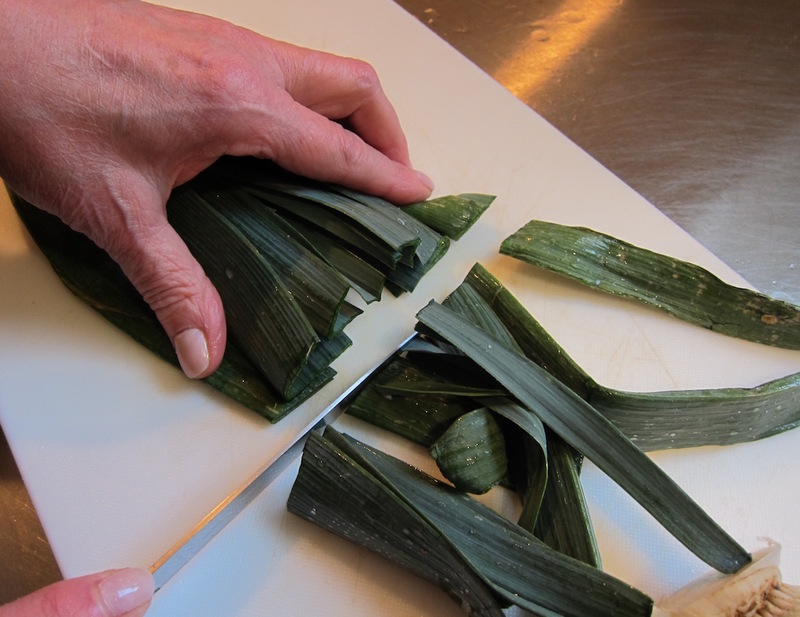 Then cut everything crosswise into slices, including all the flavorful green fronds. They are a cousin of dill. 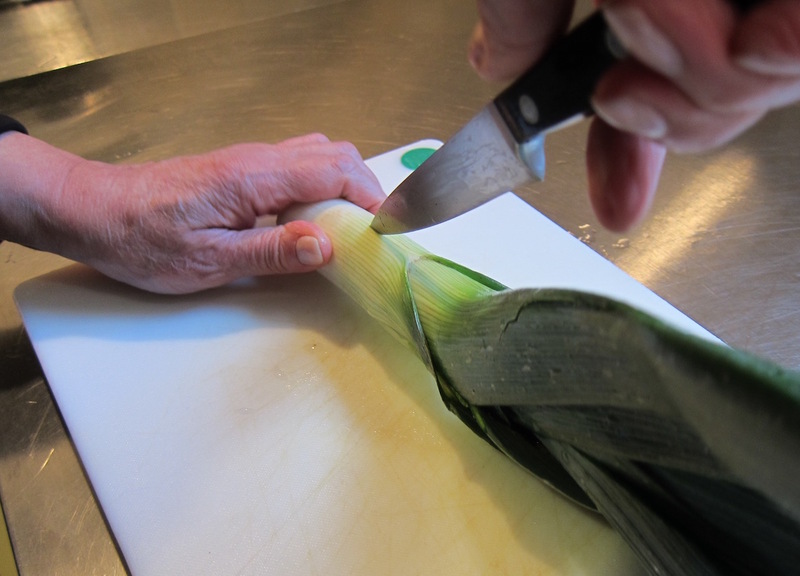 Prepping a leeks begins the same way. Cut off the tip with the roots. 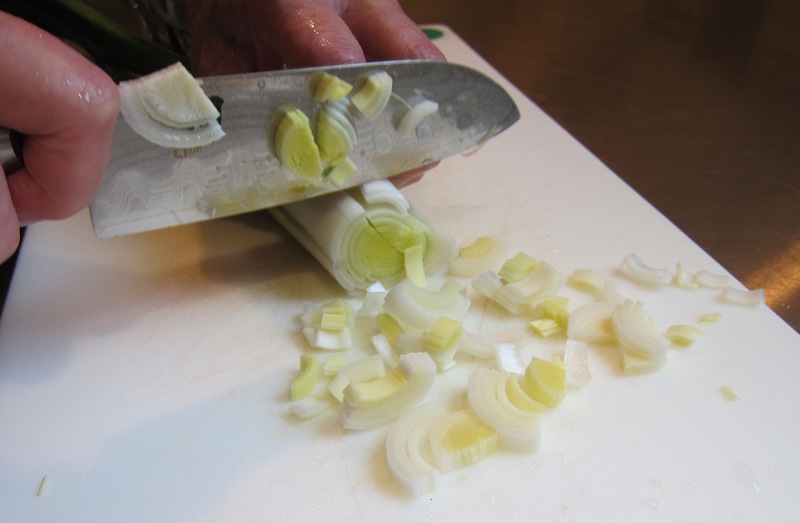 Cut off the dry ends of the dark green top and reserve for use in another soup or for broth. Then give it a quarter turn and split it lengthwise again to open it up. There usually is a good deal of sand between the leaves. Rinse the leaves under running water to remove all the sand. Cutting it lengthwise allows the fibrous leaves to open like a flower. Then cut the white part crosswise for use in these soups or any other recipe. The backbone of the soups, however, is my enriched chicken broth — ebroth for short — which I make by simmering the carcass of any cooked chicken, half an onion, a few celery leaves and some dried thyme with commercial chicken broth, covered, for about 45 minutes. Enriched Chicken Broth from Atticmag on Vimeo. It’s important not to let the broth simmer too quickly — this video shows a good rate for that. The most intense broth results from cooking any chicken frame (all the bones stripped of meat and skin) with 1 quart of boxed broth but that can be stretched to 2 quarts. The only tricky business is setting up the assembly line of warm bowls for the two soups — with the garnishes at the ready — and then ladling the simmering soup into each one. Serve immediately! With family and guests on hand at the holidays there should be no short supply of willing helpers to ferry the bowls to the table. 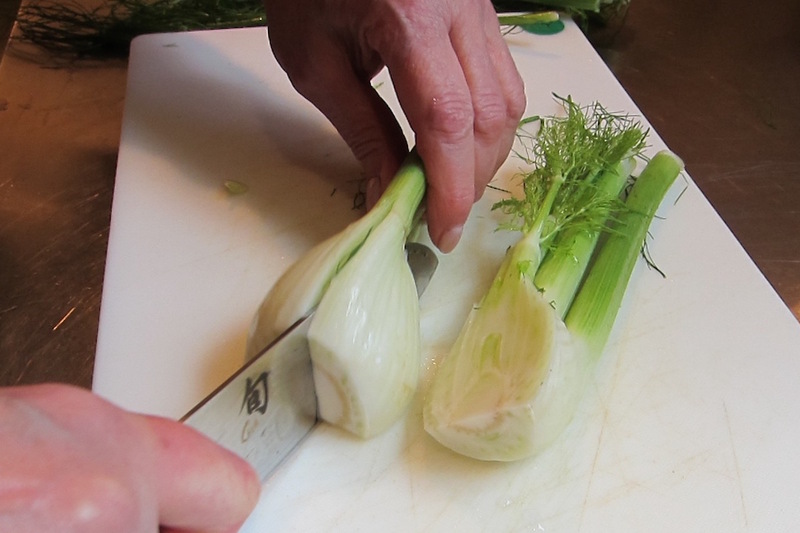 Trim the bottom off the fennel bulb. Cut the bulb in quarters and slice crosswise. If very large, remove the fibrous “heart” from the bulb. 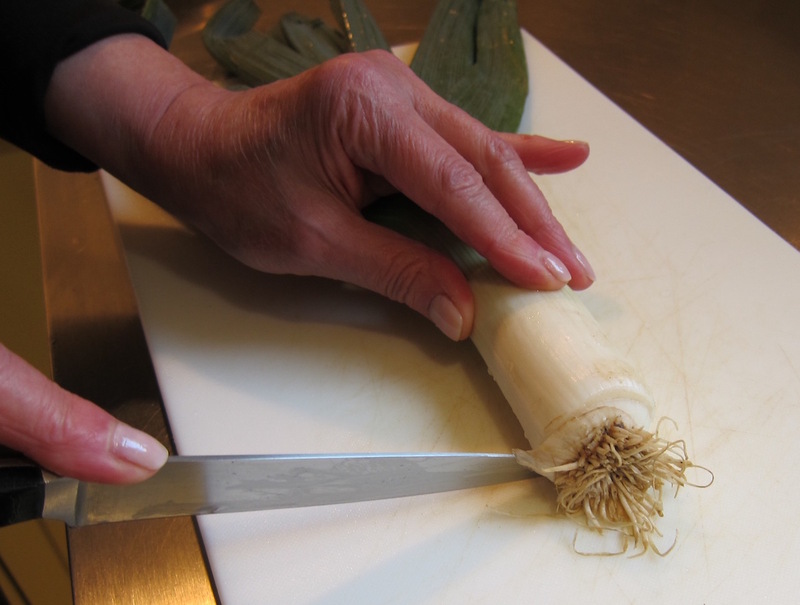 Slice the bulb and the bottom inch of the fennel stalks along with the fronds; set aside. Heat butter and oil in a 4 to 6 quart soup kettle. Add the fennel, celery, leeks and garlic. Stir the vegetables then cover and cook over medium-low heat, stirring occasionally, until vegetables soften and give up their juices, about 30 to 35 minutes. Add the potato slices and stock. Cover and simmer over low heat until vegetables are completely softened, about 50 minutes. Uncover and cool mixture slightly. Use blender to puree in 2 cup batches until completely smooth. Can cool then refrigerate until serving time up to 2 days. Using a food processor, coarsely chop or shred the peeled squash cubes. Transfer squash to a 4 to 6 quart soup kettle. Add the garlic, leek, onion and stock. Cover and simmer, stirring occasionally, until the squash is completely softened, about 50 minutes. Uncover and cool mixture slightly. Use a blender to puree in 2 cup batches until completely smooth. Can cool then refrigerate until serving time up to 2 days. 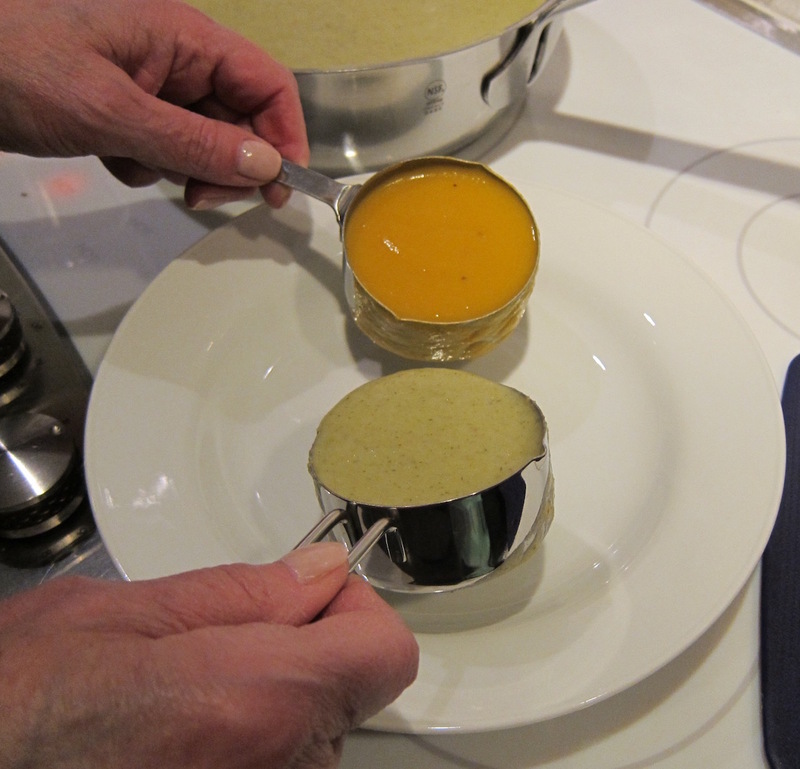 Before serving time, put each soup to a separate large saucepan. Stir remaining ingredients into each soup. Heat soups to simmering on low heat. Cover and keep both soups hot until ready to serve. To serve, taste and adjust seasoning again, if necessary. If using minced chives as garnish keep those nearby. If using sour cream, dilute it slightly with some half and half and have a bamboo skewer nearby. Set out warm flat-bottom soup bowls. Use two 1/2-cup measuring cups and, working from opposite sides of each bowl, pour 1/2 cup of each soup into each bowl at the same time. Garnish each bowl with minced chives or dot the squash soup with 3 or 4 dots of sour cream and then connect them by carefully dragging the skewer through the centers. Serve immediately. I am very fond of pureed vegetable soups. I always blame Vichyssoise which I ate as a child. For me they are comforting and delicious as well as healthy. Cutting through a butternut squash takes a good deal of hand strength. I usually do that with a cleaver if I’m using whole squash. Then the thick skin needs to be peeled, seeds scooped out and the yellow flesh cut into chunks. While that yields the best flavor, it is easier to deal with pre-peeled chunks of butternut squash sold in packages. What’s not clear is how long it’s been in the package. But that’s the trade off for making things go more quickly. Why the white part of leeks only? 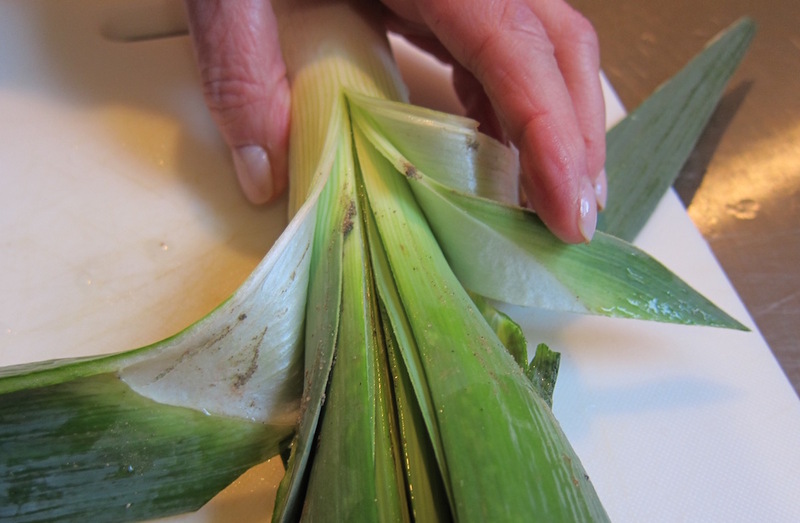 - The white part of the leeks have a fabulous flavor but won’t change the soup color. And while the white bottom portion of the leek is fibrous, it’s not as tough as the upper green leaves which don’t puree as well. Save the greens and slice them up for use in chunky soups where the make pretty slivers. Do take the time to enrich the chicken broth. I cook it up every time we finish a chicken and then put it in the freezer until I need it. It offers a huge boost of flavor and once you become accustomed to that extra intensity, you’ll start using it in other recipes — betcha! Both soups can be made 2 to 3 days in advance. You can likely push that by another day by cutting up the vegetables, bagging them and holding them overnight. Chives can be minced several hours in advance. I usually keep them in very small 2 oz plastic containers. Hot pepper sauce - If you’re tempted to reach for the sriracha, think twice. The pureed red chiles is more likely to give the soup a murky color — especially the fennel — than Tabasco sauce, which is what I use. Leeks - Occasionally I cannot find leeks. Regular white onions can be substituted although the flavor may not be as subtle. 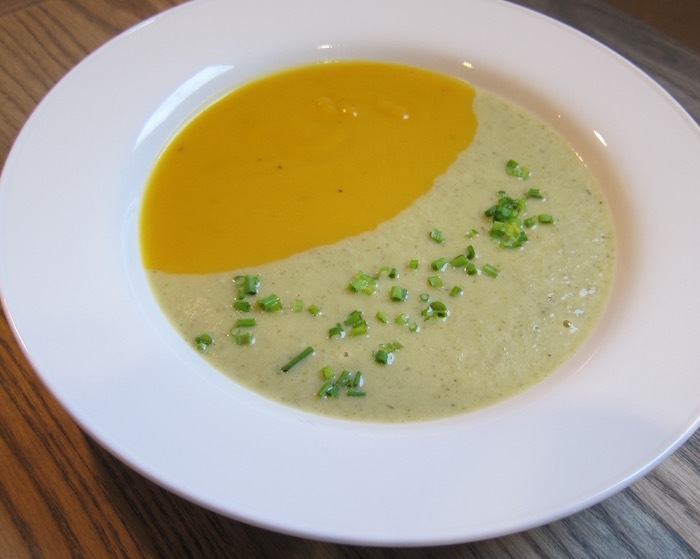 Fennel haters - Other green vegetable soups that could be substituted as a good match for the sweetness of butternut squash would be zucchini with curry.